Artist Dan Graham and writer Jessica Russell's playful Architecture/Astrology considers some of the most important and innovative figures in the world of architecture from an angle few would expect: their star signs. Originally published as a column for Domus magazine, Graham and Russell's book integrates critical analysis with astrology and mythology to offer alternative perspectives on the work and personalities of artist/architects including Frank Gehry (a restless, dreamy Pisces), Frank Lloyd Wright (a romantic Gemini with one foot in the past and the other in the future), Eero Saarinen (a dynamic, dramatic Leo) and Le Corbusier (a logical, balanced Libra). 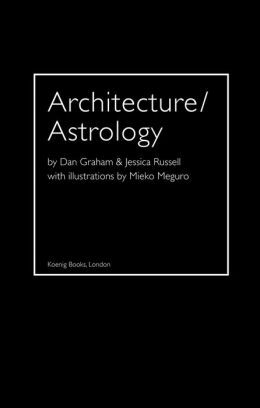 With accompanying illustrations by Mieko Meguro, Architecture/Astrology itself resembles the best sort of architect, one who is at once rigorous and whimsical, with his feet on the ground and his head in the clouds. Cologne, 2014, 17cm x 12cm, illustrated, 60pp, paperback.